It's clear that the over the past few years that the Sens marketing department has faded into a shadow of its former self. Whether it's due to budgetary reasons or the loss of key members, it has definitely affected the team's game day experience as well as other Ottawa Senators related events and promotions. Amelia over at Silver Seven Sens has written a great article on how she thinks they can turn it around in a hurry. I also previously wrote an article showing how even the season ticket holder perks have gotten worse. However, the focus of this article will be on the aspects that the Sens marketing department have changed in recent years. Too much focus on kids: I can see where the Sens marketing department is going here: get them while they're young and hopefully grow your fanbase for the future when they can afford to buy their own tickets. It was painfully obvious this season where the large majority of gameday promotions involved buying an adult ticket and getting a child ticket (I believe it was 14 and under) for free. In addition, every game had a balloon artist on hand to entertain the children. They also brought in Slush Puppie machines (okay, I'm actually very happy they did this). Metro, Subway and Pro Line Intermission Entertainment: Alright, well Eugene clearly needs the sponsorship money. So let's do the same thing every intermission! The stupid "Battle Cards" where four people, one in each corner face-off circle try to push a grocery cart closest to center ice to win a gift card courtesy of METRO! I don't even know what the Subway one's called, but it just involves one person lying down wearing a bun suit while the other person throws some giant sandwich items on him/her before lying on top of him/her wearing the same bun suit. The last major intermission event is the Pro Line Dash for Cash, where a blindfolded person is directed to a bag of money by the crowd's cheering. If it isn't one of these three then it's usually a game involving minor hockey teams. The Sens really need to expand their intermission entertainment in my opinion. Right now nobody cares to remain in their seats when it's the same thing over and over again. Speaking of intermission entertainment, what about pregame? Which leads us to take a flashback at some of the successes that we had in the past. Swipe and Score: Who remembers the Swipe and Score program which was immediately cut when Eugene Melnyk took over the team? 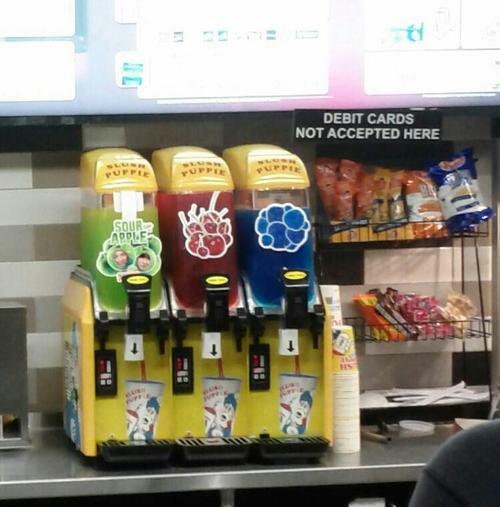 It involved swiping a special card that you signed up for at any kiosk located around the arena. Each game you swiped the more points you received. The more points you got, the bigger prizes you earned. Starting from small items like a pop or popcorn all the way to jerseys. Each swipe also gave you a chance to win tickets, among other items. This encouraged non-season ticket holders to try to go to that extra game to get enough points for that next prize. It was a great program and fun for all ages. The likely reason it was cancelled is that team team was giving away a fair amount of free stuff, but I'm sure it helped bring some people into the building. The only article I can find on it is here. Score Magazines: Everybody remembers the Score magazines, the free, ad-filled magazine that always had a helpful lineup sheet so you could recognize the opposition players. 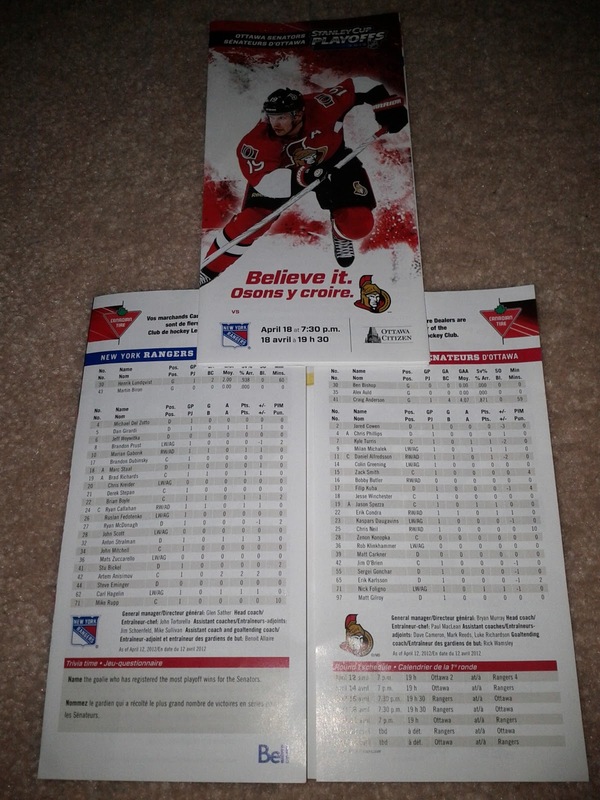 The Senators eventually removed the lineup sheet from the magazine, making it a separate insert on the back of a mini Sens poster. This was one of the marketing department's better ideas in my opinion. Those mini posters were great for decorating a desk, locker or cubicle. 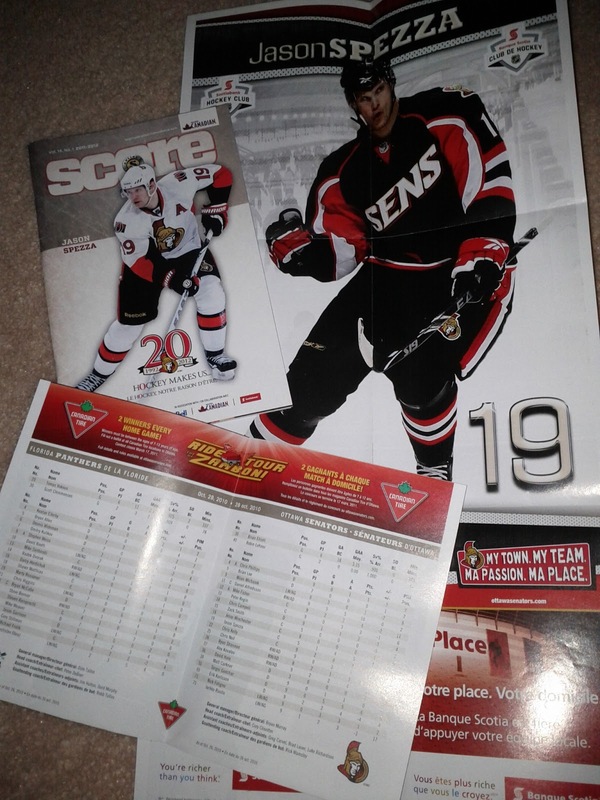 Unfortunately, the Sens cancelled this program this past year, replacing it with a new magazine (I forget what it's called) that costs $3 and includes the lineups for several upcoming games. It is slightly higher quality, but still filled with ads. 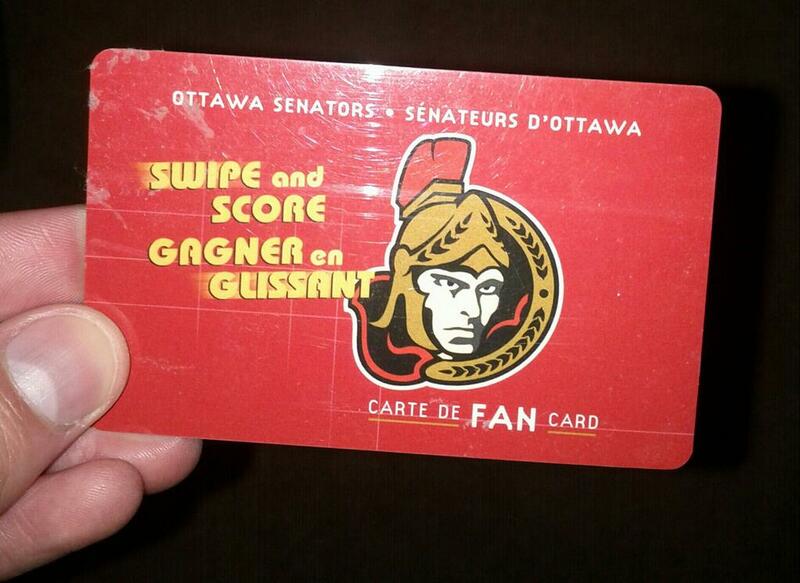 The Sens didn't even notify the public they did this, leaving fans to find out for themselves. I saw many try and grab the magazines off the stand thinking they were free and having to be stopped by the seller. Now I can understand why they would cancel the Score magazine, due to the use of so much paper and the large majority of the magazines being left behind. But why couldn't they do the style they did for the 2011-2012 playoffs where they gave you a brochure with the lineups, or alternatively only provide the mini poster like before? Now this season you had to overhear the casual fans asking "Who's #18? ", "Isn't that Jesse Winchester." The Ottawa Senators Fan Fest: The most recent online link I could find describing the Fan Fest is here. It's the event the Sens hold to open the season, but it's merely a shadow of its former self, just like the Sens marketing department. 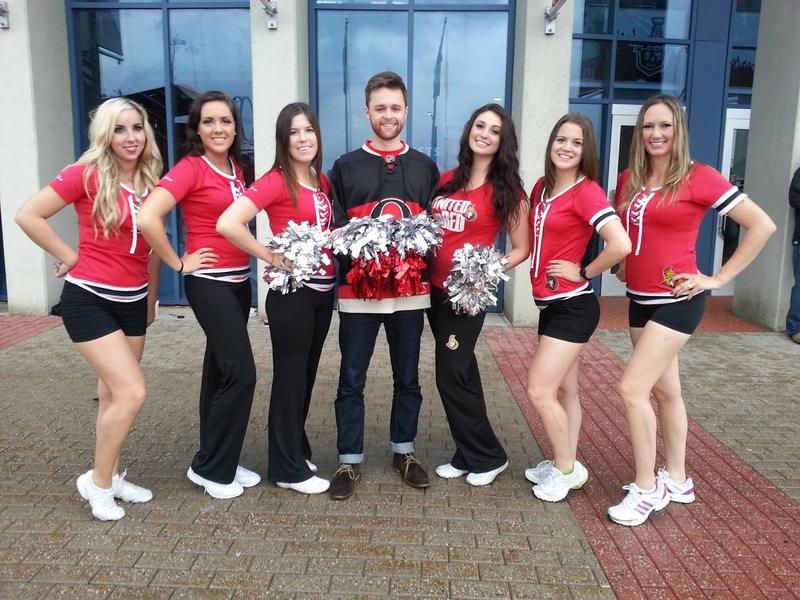 The 2010-2011 event offered open practices, roaming entertainers, the usual inflatable activities as well as 20% off at the Sens Store. However, if memory serves me correctly, the earlier versions of the Fan Fest were far superior. Instead of holding open practices which aren't that special, they actually held a legit scrimmage with the full team which was a blast to watch. Afterwards they would have meet and greet sessions with the players open to the entire public. This leads into the difficulty for fans to meet their idols if they aren't season ticket holders. Canadian Tire Signings: The Sens rarely have team sanctioned meet-and-greet events these days. This past season, to my knowledge there were only two Sens specific meet-and-greet events in Ottawa, neither endorsed by the Sens. The first involved Colin Greening and Erik Condra at local rinks supporting DIFD. The other was at Jim Keay Ford Lincoln in Orleans with Kyle Turris, Craig Anderson, Peter Regin, and Matt Kassian (who I believe are all sponsored by Jim Keay). There was also one with Mika Zibanejad before the season for the NHL 13 midnight release (although Sens got the short end of the stick in terms of player quality... except for Calgary but that's expected). The last two Sens endorsed signings would have been in the 2011-2012 season. The first was Kyle Turris at Sport Chek (I'm 90% sure this was team endorsed because the Sens logo was used). The other was the surprise signing by Nick Foligno at Sport Chek which you needed Twitter or Facebook to find out about. However, we have to rewind to the beginning of the 2010-2011 season for a mass public signing where the Sens spread out ten different players across Canadian Tires in Ottawa. I do recall the Sens hosting these events at Canadian Tires in earlier seasons as well, mainly because I found this lying around. 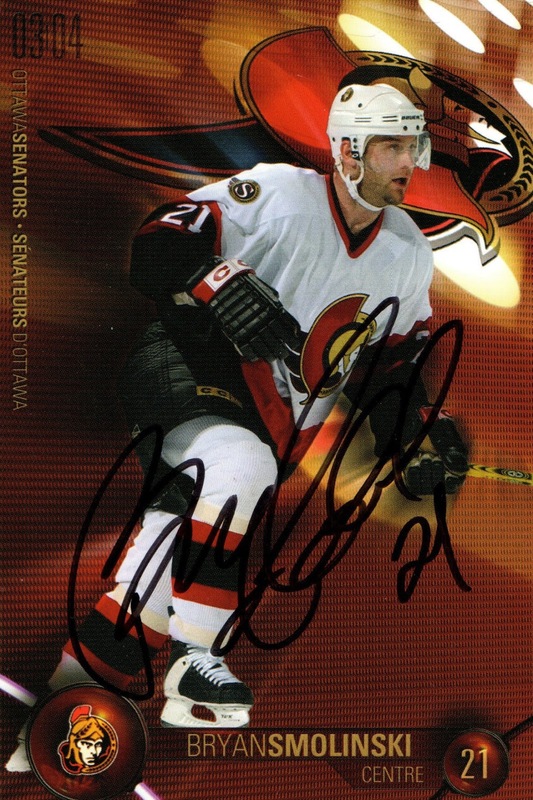 It will definitely be interesting to see with the new partnership with Canadian Tire if the Sens will bring these autograph signings back. They might also host some at Sport Chek which is owned by Canadian Tire. The question is will the Sens ever make the big name players available. I don't even know the last time Sens captain ex-Senator Daniel Alfredsson was made available to the public besides the All Star Fan Fair. I know the last time Jason Spezza was at a public meet and greet (excluding the All Star Fan Fair) was the Kanata Best Buy grand opening which was ages ago (and this wasn't a team endorsed event). Game Giveaways: How the quality of game giveaways has dropped, now the best you expect to get is a pin. Remember when we used to actually get these high quality items? Now there's probably a lot more marketing successes from the past that I can't remember off the top of my head. 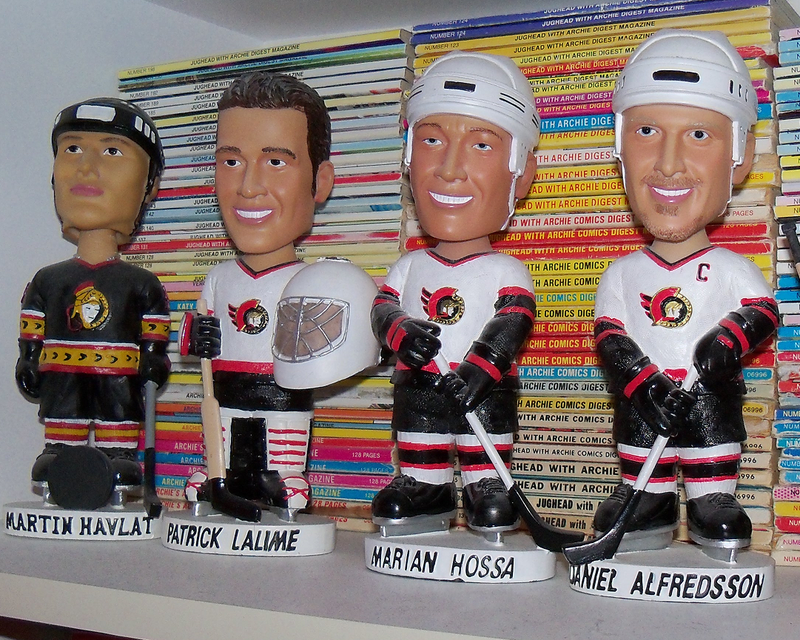 However, it's clear that the Sens marketing team either had a bigger budget in the past or were just plain better. Not to say that the current marketing team hasn't had a few solid ideas such as the Alfredsson 1000th game t-shirts as well as showing local talent such as this and this on the jumbotron. They've also done a good job with the video montages, including one showing every OT playoff goal prior to the overtime in Game 3 against the Penguins this past season. I also recall they had a cool partnership a season ago with some Sirius radio station to hold local bands in a box to play music pre-game and during the intermissions. Do you have anything to add about the past or present? Feel free to shout out in the comments. The Most Action-Packed Day in Senators History? Has Daniel Alfredsson re-signed yet?